I was lucky enough to receive an ARC of The Way of Beauty from NetGalley and I couldn't wait to start reading. I loved both of Di Maio's previous novels and this one is equally wonderful and yet totally different from the others. At its heart, this is a love story or really two separate love stories. The first section of the book follows Vera, a young German girl living near the newly built Penn station during World War I and the second section follows her daughter, Alice, still living in the same neighborhood during World War II. 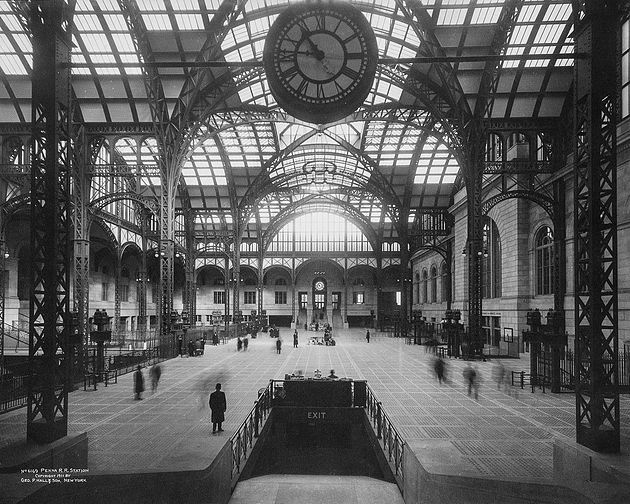 The stories are sandwiched by a prologue and epilogue in the early 1960's as Penn Station is being demolished to make way for Madison Square Garden. Both Vera and Alice struggle with what it means to be a woman during their times in history and how to find a partner whom they love but also allows them to retain their individuality. The ups and downs of their romances are quirky and interesting and kept me turning the pages, but for me, Penn Station was the most unique and riveting character in the story. Though I lived in Manhattan for ten years, I never knew why the station is in the basement of MSG, and that there used to be a gorgeous above ground portion of the station as well. All of the characters in the novel have a connection to the grander and beauty of the former station, the majestic eagles watching over and protecting them from day to day. When they learn of the slated demolition, Vera suggests that this is the "way of beauty," that when things lose their shiny newness, no one is interested any longer, but Alice, who studies architecture and has a fondness for historical buildings, argues that age actually makes things more valuable. "That is exactly why I love old buildings. They have history. The things they've seen. A new building is an empty shell. Sure it's plumbing may run smoothly, but it has ever embraced a cheering crowd or housed a dramatic performance or sponsored a ghost?" The true value of a place lies not in its outer appearance, but in its history and accumulated wisdom. The same could be said for the women in this story. As each of them ages and matures, they learn what is truly important and begin to prioritize the relationships and pastimes that truly fulfill them.